Posted on November 15, 2017 at 10:14 am. When it comes to real money pokies, House of Jack is one of our top-rated online casino sites. Not only is the game selection already impressive, but House of Jack is committed to constantly growing its collection of online slot games, this month adding two new titles to the mix. To celebrate the release of new pokies Mighty Arthur and Stampede, House of Jack is giving players the chance to claim free spins to give these new releases a try. To get the free spins, you need to be a registered member at House of Jack. If you’re not yet a member, sign up here and make your first real money deposit and House of Jack will match it by 100% up to $250 when you enter promo code ‘JACK1’. There’s also matched deposit bonuses to be claimed on your second and third deposit, with $450 in bonus money available all up, plus 100 wager-free spins to use on a selected online pokies game. 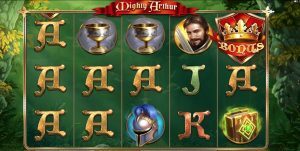 Available at House of Jack from November 14 onwards, Mighty Arthur is the latest online pokies game from leading software developer, Quickspin. This exciting, action-packed slot uses a medieval fantasy theme set against a background of a lush green forest, with symbols made up of all kinds of mystical icons like spell books and goblets. The Merlin symbol acts as the games wild, triggering some awesome wild bonuses, while King Arthur is an expanding wild symbol that has the power to trigger some huge wins. Deposit at least $20 at House of Jack between November 14 and November 16, enter promo code ‘MIGHTY’ and the casino will reward you with 20 free spins to use on Mighty Arthur. Put November 23 in your diary and get ready to play Stampede, the fun new African themed pokies game from BetSoft, an award-winning developer of premium 3D online slots games. Stampede looks like it might be one of their most impressive creations to date, taking players to the sun-drenched savannahs of West Africa where elephants, zebras, giraffes and eagles roam across the reels. This is a 1024 Ways pokies game, and comes with an exciting ‘Double Up’ feature which gives players the chance to double their money after every win. Deposit at least $20 at House of Jack between November 23 and November 25, enter promo code ‘STAMPEDE’ and the casino will reward you with 20 free spins to use on Stampede. Note: All promotional offers at House of Jack carry a minimum 40X wagering requirement and free spins expire within 30 days. We strongly suggest you read the terms and conditions of these bonus offers at House of Jack to ensure you fully understand your rollover requirements. House of Jack is one of our most highly recommended casino sites for online pokies fans, with hundreds of instant-play games available from the best software developers including Quickspin, BetSoft, Pragmatic Play and Spigo. To find out more about House of Jack, its bonus offers and deposit methods, read our detailed House of Jack review.